Last week, my trusted hairdryer finally gave up on life. It had a tough upbringing, my hairdryer; in its five years, I had thrown it down the stairs, used its head as a door-stop, almost drowned it in the sink, kicked it across the room when it got in the way… Yet it stuck with me, bless it. Even when I drunkenly used the extra-long ‘convenience’ cord as a skipping rope. But it has gone – not in a shower of sparks like its predecessor, but with a dignified bowing-out: it simply failed to wake up when I switched it on. RIP dryer. Thank God, then that I had a new one delivered the very next day – a lovely white one with drawings on it! 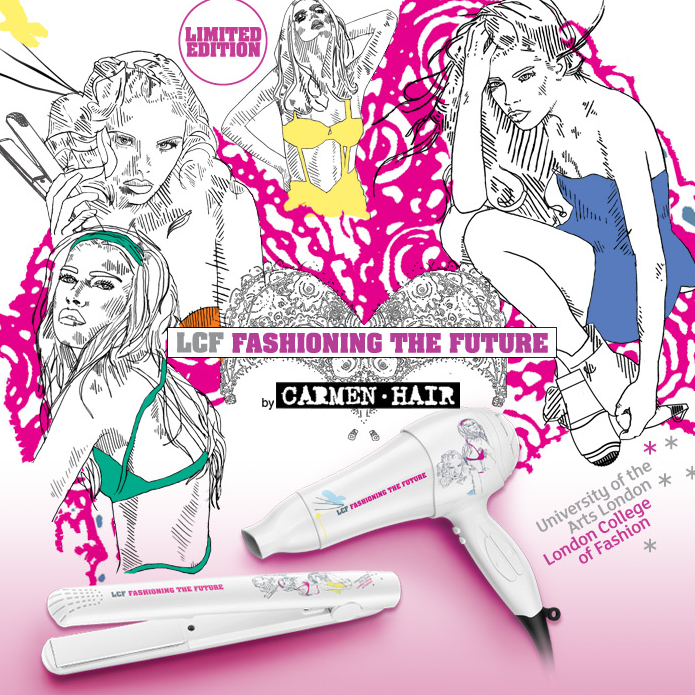 I am speaking of the new, limited edition Couture Dryer by Carmen, which sports the illustrations of Aurora Alyssa Patag, winner of the London College of Fashion’s design competition! It’s a nice and powerful 2000W dryer, with four heat settings, two speeds and, I must say, a very impressive ‘cool shot’ function which actually does cool, unlike the one on my last dryer, which merely blew ‘slightly less hot’ air. The important news: to celebrate the launch of the new limited edition range (there are ceramic straighteners too, which heat up in 30 seconds to 230 degrees) Carmen Hair are running an online modelling competition! All you have to do to enter is upload a snapshot of yourself on the entry page, here. It’s that easy! So anyone who has been too shy or embarrassed to walk into a model agency and ask advice, or haven’t wanted to enter previous competitions because they’re just a little bit too ‘public’ – this one could be for you! It’s quick to enter and there’s no ‘reality TV style’ bitchiness! The winner, picked out by a panel of judges (including a particular model sat not too far from this keyboard!) will get an invaluable introduction into the modelling world, meeting a top agency and getting photos to start off their portfolio taken at a professional photoshoot. Oh – and the Carmen limited edition goodies, and a pair of tickets to the London College of Fashion’s graduate show! The competition is open from now, so get on over there! Here’s the link again in case you missed it: Carmen Competition. I look forward to checking out your photos!